Spring is time for new beginnings….and all these new places to get your sip on! Formerly known as Once Bitter, Urban Alley has opened a HUGE brew pub. They’re keeping an eye on sustainability with biodegradable size pack rings, their own bio waste plant and partnering with a distillery to reduce energy use. Meanwhile, we’re keeping an eye on the 2500 litres of beer they’re brewing at once, from the cosy booths or airy alfresco area. Look for it under the Melbourne Eye. Named after famed American jazz singer Rosemary Clooney (yep, George’s aunt), this new bar sure (cover photo, by Kevin Li) is putting on the ritz with plush purple booths, deco chandeliers and the warmth of dark timber. The cocktails match the decor in sophistication by featuring a plume of smoke, infused-boozed and house made tipples. It’s all unexpected luxury from a suburban haunt. A father and daughter duo have built this new gin distillery and bar. Stepped in science, distiller Brogan has used her analytical background to balance the botanicals in her trio of debut gins as well as house made bitters, aperitifs and digestifs. Pop into the onsite bar for classic gin cocktail while you admire Gilly, their copper still all lit up in neons. You know the drill by now. Summer is heading this way fast and that means Arbory’s floating pontoon bar is back. It has returned earlier and bigger than ever. This year it brings with it a Mediterranean twist and lots of spritzy gin cocktails. The Captain has returned after four months of renovations with a fresh new look reminiscent of a fancy 1920s yacht club in the Hapmtons. A retractable roof adjacent to their perfectly positioned rooftop lets more of Summer’s charms inside. The cocktails and stunning sunset ocean views are familiar to regulars. But the most important part? THEY SERVE POTATO CAKES AS BAR SNACKS. Genius. The Wheelers Hill Hotel in Melbourne’s South East has transformed into the Rogue Squire. Take in a vista of rolling hills upstairs at the brewhouse while you tuck into an old school pint and parma. And ask the bartenders to tell you a yarn about the long ago publican who fought off bushrangers on the site. Find this new cocktail bar hidden upstairs from the Junktion Hotel. Far Q (geddit?) are doing drinks with some ethically sourced ingredients – there are even vegan sours available – and it all turns into a jazz club once a week. Look more beer! Fixation Brewing Co. have opened the doors to their ‘Incubator‘ tasting room. As you might guess from the name, this is where they experiment and you can taste the results only here, alongside their official releases and tanks. They welcome byo food and deliveries direct to the bar. FYI: it’s all IPAs, all the time. Also try: Yonder (Bentleigh), a plush cocktail bar above Sonder / vegan pizza and $10 cocktails all the time at Good Love (St Kilda) / Luxsmith Bar (Seddon) a new wine bar next door to -duh – Luxsmith / an industrial-yet-cosy garage wine bar in Wines on Poath (Hughesdale)/ Level One (Carlton) a piano bar and cult cinema in one / The Cheeky Pint (Footscray); the resurrection of the ex-Barkly Hotel / Taking a squizz at the revamped The General Assembly (South wharf); their new focus is on Melbourne laneway culture so live music, graffiti and street art. Situated in outer north east of Melbourne, Imbue Distillery have released their first gin. Two actually: one gin charmingly inspired by their extended backyard plus a barrel-aged version. Spice and honeyed gin liqueurs are on their way soon. After their first release house, dry, and savoury (licorice) all-sorts style gins recently, Barossa Valley’s Seppeltsfield Road Distillers have opened their distillery to the public. Their glass encased still and tasting room deck look like must-visits. You can now find an Australian version of aquavit. Never Never Distilling Co. have created a Scandanavian spirit in collaboration with PS40. The traditional anise flavours of aquavit are complemented by local cinnamon myrtle, riberry, macadamia and strawberry gum. Strangelove have invented three interesting new mixers. There’s a dry ginger ale with applewood smoke and burnt sugar tailored to dark spirits, a fancy lemonade with clemetine oil for your vodka and gins, and a salted white grapefruit with river salt from the Murray which screams mezcal or tequila time to me. The winner of Brookie’s Gin and Stone and Wood’s first Brewstillery Mixmasters cocktail competition is Damien Kos from the 18th Amendment with a Cape Byron punch that included the gin, beer and an iceberg of native botanicals. 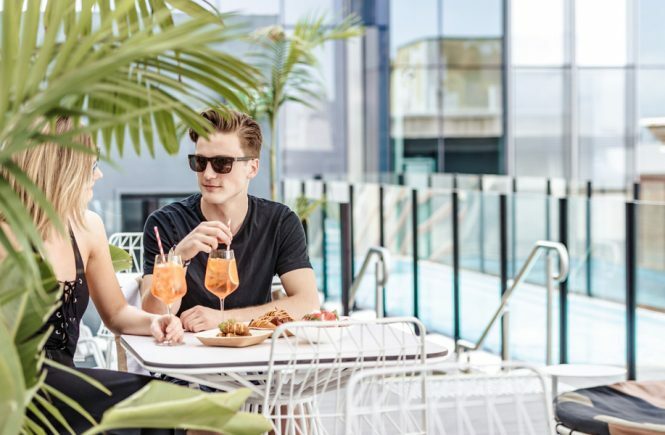 Jenna Hemsworth from Sydney’s Restaurant Hubert was dubbed Bartender of the Year – the first female victor – for Bartender Magazine’s Australian Bar Awards. And in big news from the world stage, Orlando Marzo from Lume has been crowned the Bartender of the Year of the World Class cocktail comp! Pastuso will shake up their 100,000th(!) Pisco Sour sometime this month. To celebrate the hallowed occasion, they are are giving away Pisco Sours for FREE all October when you book online for lunch. Plus the person to drink the 100,000th sour will win a pisco prize including multiple bottle of premium pisco in collaboration with The Pisco People, pisco discounts and Pisco powered lunch for two. Sounds like a good excuse to turn your next power meeting into a long lunch. Marionette have released a limited edition Tasmanian redcurrant liqueur called Groseille with good timing. It can make cocktails prettily pink for Spring soirees or ruby for the festive season. Yum! The Farmers Wife based out of an Allworth farm in New South Wales have debuted their first release: it’s an Autumn Dry gin with local botanicals of pepperberry, myrtle, sage and sugar bag honey. They have big plans for rum and whiskey in future. Bathhurt’s Stone Pine Distillery are celebrating their ten year anniversary. They’ve created a ‘Decade’ dry gin with 10 botanicals – juniper, lemon myrtle, saltbush, orris, coriander, angelica, licorice, finger lime, black pepper and ironbark – one for each year. Fan of Kilderkin Distillery’s gins take note: they now have new name. You can find their London dry, original Australian, navy strength and barrel-aged drops under the cheeky ‘Larrikin’ label.